If you’re in Calgary, you know that the past couple days have been just like winter out there. Overnight the earth was covered with a foot of snow and the winter boots and shovels came out. Babywearing changes with each season, with little (or big) adjustments being made to how we wear our babies to allow for the most comfort. Winter is no exception, and now babywearers all over Calgary and area are adjusting their practice in response to the cold weather. 1. Just bundle up! Honestly, this is sometimes the easiest route depending on a couple things, like how old your baby is and what you plan on doing. For instance, if your baby/toddler is 2 and likes to run and be carried, than it is sometimes easier to pick something where you are free to let your child up and down, but also be warm. In this case, make sure you have some leg warmers for under the pants that will inevitably ride up when he/she goes in to the carrier, and you may want to pick a carrier that is really adjustable, like a ring sling, wrap or mei tai, so that it fits even with winter coats on with very little adjusting. Another reason you may opt for the “just bundle up” route is if you are expecting and can’t quite make any of those awesome babywearing jackets fit properly. One thing I now notice that was missed here in the picture though is the leg warmers. Leg warmers are basically an essential if you go this route, as you can see by the little bit of skin peeking out from above the boot. 1. Can I wear this for front or back wearing? Let’s be honest here, some babywearing jackets say they work both ways, but then really just look like you’re wearing a coat backwards when doing back carries. I don’t know about you, but I don’t feel like reliving the early 90s and wearing clothes backwards (if this makes no sense to you… google Kriss-Kross, jump). 2. Can it be worn any other time aside from babywearing? For instance, can you wear it while pregnant, or even just as a regular non-pregnant, non-babywearing jacket? If you’re looking for versatility, this may be something you want out of your babywearing jacket. 3. Is it easy to use when by yourself? Really, it doesn’t matter how fantastic a jacket is, and how great it is for backwearing… if you can’t easily figure it out when rolling solo, you won’t wear it. Some exciting news for the Babywearing Calgary group is that we have a Mama Parka on route for our lending library. These jackets average at a $425 retail, so it will sure be nice to try before committing to buy! I for one am super stoked on it’s arrival, man does it look beautiful! This is one of the reasons our lending library has a 2 week lending limit though, so that everyone can have a chance to try out some of the wonderful items that we are so lucky to have. 3. Babywearing ponchos. A babywearing poncho is exactly what it says… a poncho that is made to wear while wearing your babe. It is essentially a poncho with 2 head holes and a little more room for a carrier. These can be worn with any carrier and are usually good for front or back. The reason these don’t typically look awkward for back carries is because a poncho is typically the same on the front and the back, so no awkward pockets, zippers or collars gracing your back while back wearing. Depending on the weather you may dress your little one a little warmer (and yourself) when using a poncho, as it’s not necessarily going to keep you completely warm in our cold winter climates. That said, ponchos are fantastic for fall and spring, or to throw over you and your little while going between car and location… or even for snuggling around the house on a cold winter day. And more exciting news for the Babywearing Calgary group is that we have a Mamaponcho on it’s way to our lending library. It hasn’t arrived yet, but it is on the way and will be available for rent very shortly!! Thank you Mamaponcho! 4. Carrier Covers. These are accessories that you can attach to your carrier to go over baby to keep them warm. 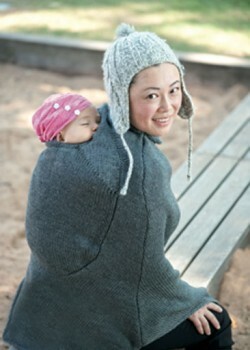 This eliminates the need to completely bundle up your babe, and is a pretty easy and quick option for cooler weather. Again, you want to check to make sure the cover can be used easily for back carries, although the covers typically attach to the carrier straps, making them generally easily usable for front and back carries. 5. Fleece covers. Probably one of the more popular winter babywearing options are the fleece covers, which can be found in either vest form or full sweater style form. Either work good, but if it’s really cold these typically don’t hold up without a little extra bundling. Or if you live somewhere that is constantly windy (ahem ahem.. Lethbridge), these will not keep the wind out. These can typically be used for front or back carries, but some will work better than others to avoid that “I’m wearing a fleece backwards” look. Similar to the ponchos, these are fantastic for fall/spring and running between vehicle and location. With a little extra bundling either under or over, these covers can provide just the right amount of warmth (dependent on temperature outside of course). This is another item we need in the lending library, so if you have something please shoot us an e-mail! 7. Amauti. An Amauti is a tradtional Inuit parka designed to carry baby in a back pouch while keeping mom and baby warm. 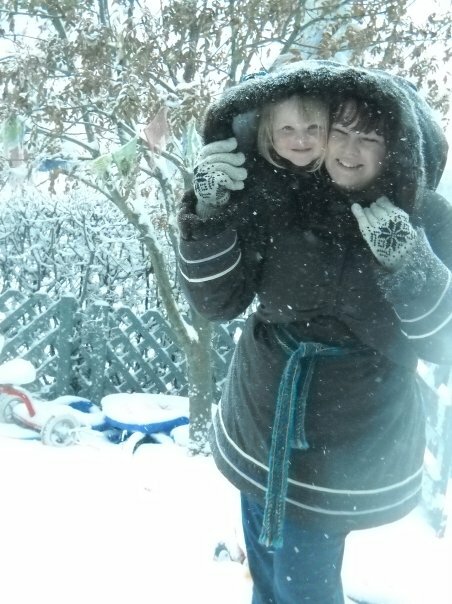 Often people typically think that the babies are carried in the hood of the parka, although while the hood is definitely large enough to cover both babe and mom, the child does not actually go in the hood. The baby sits in a pouch created from the back of the parka against mom’s back. 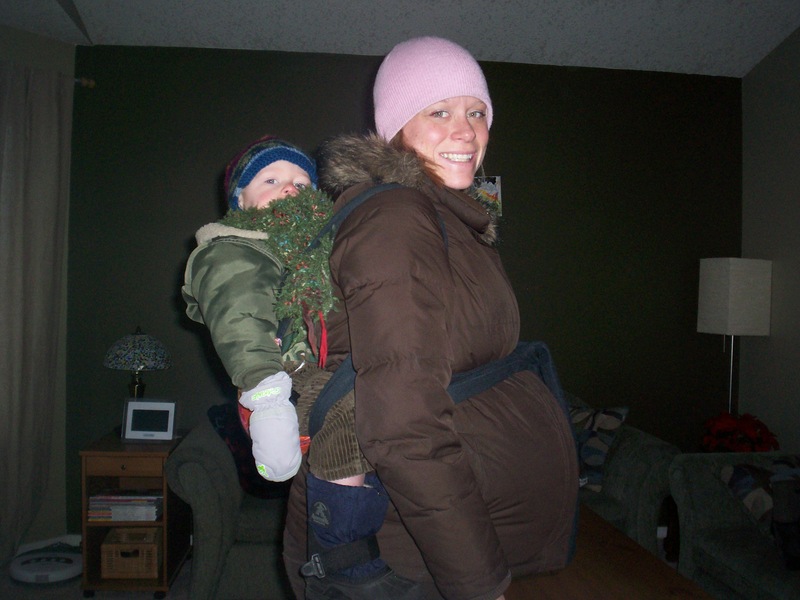 According to amautibaby.com “you can amaaq (carry) a child to 2-3 years in an Amauti”, although the parkas are often large enough to carry bigger children as well! I just carried my 4.5 year old in an Amauti, and it is now her favourite way to “ride”. Things to think about with an Amauti is what you are planning to do. Because the baby/child goes in to the parka with no shoes and without much winter wear at all, this is a carrier that you would use if the baby/child did not need to get out (unless you have outerwear handy). Also, remember to still dress for the weather and wear a scarf and/or toque, if the hood is down you will likely feel a draft. Authentic Amautis are hard to find and often need to be custom made, unless you live where they are made locally. The intellectual property of the Amauti pattern is protected and the seamstresses will not (and should not) disclose their design to anyone, so you must go through a legit seamstress from up north to get one. You can contact a seamstress at Amauti Baby to inquire about having an Amauti made for you. We are lucky here at Babywearing Calgary to have a co-leader who happens to own 4 Amautis (yes, you read that right… FOUR), so if you would like to try an Amauti, come to a meeting! They are not available for the lending library, but I know Jen would love to help you try one on at a meeting. Well, I hope this breakdown of all the winter wearing options has given you a few things to think about, and has not completely complicated the issue for you. 😉 What I have found in my experience is that winter wearing options are just as personal as carriers themselves, and all good in their own respect. There is no one solution to all your winter wearing needs, and not one option will suit everyone. It’s a matter of determining what is important to you in a winter wearing option and then seeking a solution that will support your needs. We are working to make these options available for you to try out at the Babywearing Calgary meetings, so please come out! Or, if you have a great winter wearing item, please bring it to a meeting and share! And lastly, if something awesome was missed here, please e-mail babywearingcalgary@gmail.com and I will add it to the post.